As an avid knitter of top-down, seamless sweaters, I am acutely aware of their virtues, but also their vulnerabilities. The very thing that makes a seamless sweater so delightful (i.e. no seams) can be its Achilles heel. Seams provide structure and longevity to the shape of a sweater. 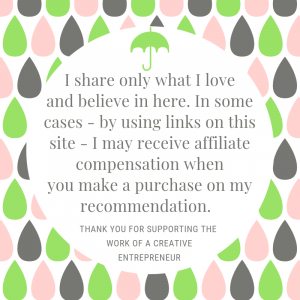 But you know me – you know I’m a rebel with a cause – and I’m committed to navigating this world of seamless sweaters in a way that helps us magnify their advantages and compensate for their weak points. 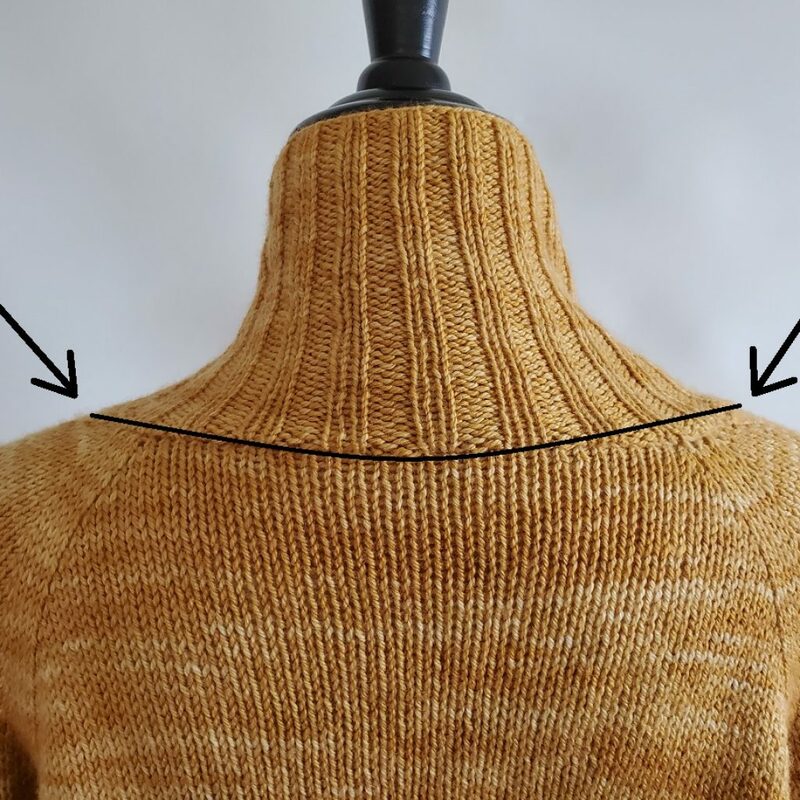 If you’ve knit a seamless sweater and it seems to lack enough structure in the neckline – and perhaps it has a tendency to slide right off your shoulders while you’re wearing it – consider these tips for both preventing and fixing their potential trouble spots. Knitting a seamless sweater is a strategic process. Sticky/crunchy natural wool has a tendency to stay on better and maintain its shape over time. Yarns that tend to be softer, silkier and/or slippery can be a disadvantage for a seamless sweater – especially a cardigan. 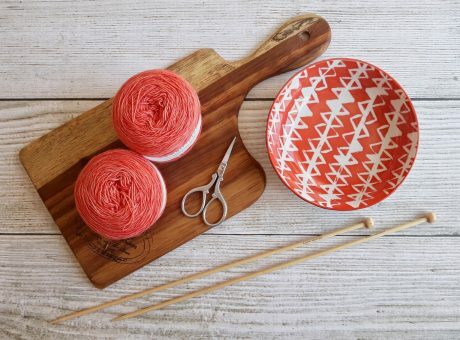 Keep this in mind when selecting the yarn for your project. 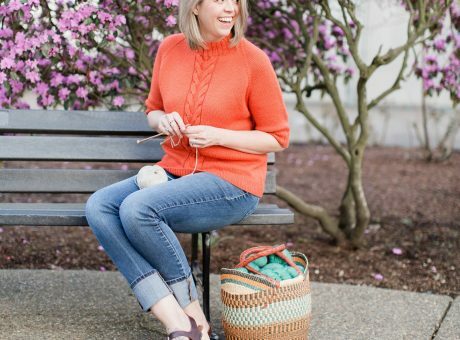 Believe it or not, your cast-on method (and the tension you use while casting-on) can affect the way your sweater neckline fits in the end (speaking specifically of top-down seamless sweaters). I like to use a cable cast-on because it has a bit more structure and substance to it, and I work mine with firm tension (one might even call it a bit tight). Note: I know it’s tempting to cast on loosely so your first row is easier to work, but resist this temptation. If you don’t want a loose neckline, don’t use a loose cast-on. 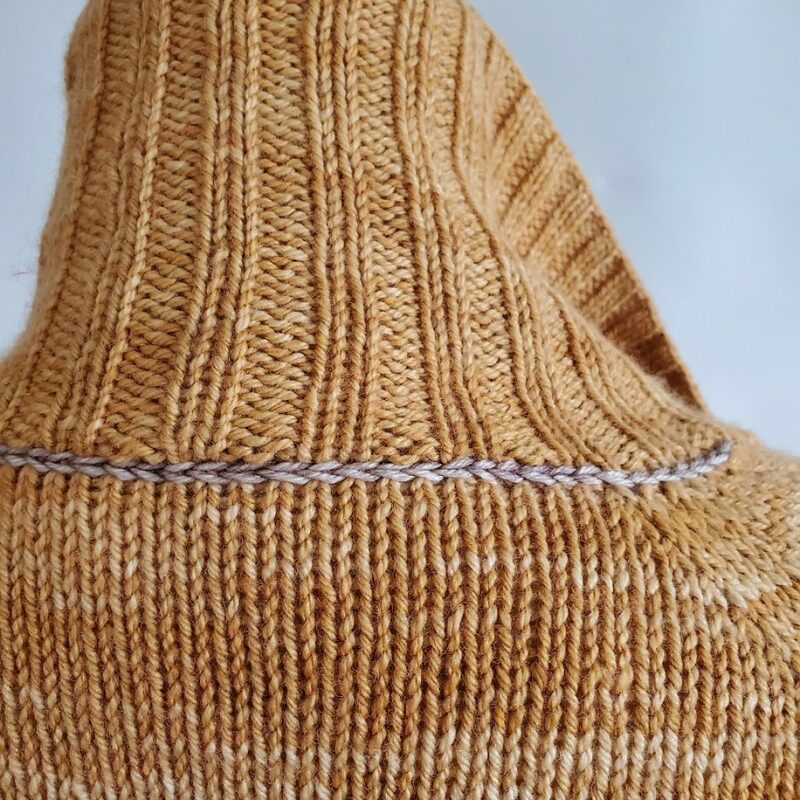 Picking-up stitches seems to be the bane of existence for many knitters, but when you pick up the neckline after the fact, you’re able to add structure to the neckline. Picking-up the neck stitches also gives you the ability to control the finished fit, by picking up a few more or a few less, and working the neck ribbing a little tighter or longer in order to get the fit you want. Don’t underestimate the power of finishing – it can change the entire fit of the upper body and, ultimately, the look of your sweater. 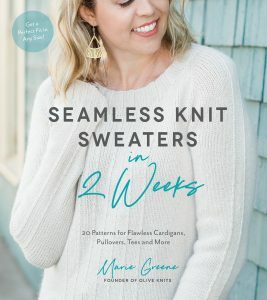 Knowing how to prevent a wobbly/unstable neckline is great and all, but what about the sweaters you’ve already finished? Don’t despair. Here’s my quick and easy trick for fixing an existing neckline. A few yards of the yarn used for the sweater, or yarn that matches closely. The section that you’ll generally reinforce will be the tops of the shoulders and the back of the neckline. You can work this technique all the way around the neckline, but generally speaking, if you reinforce the shoulders and back of the neck, that gives you adequate support. The area lined in black is what we’ll be reinforcing. In this example I am using contrasting yarn so you can see the stitches. 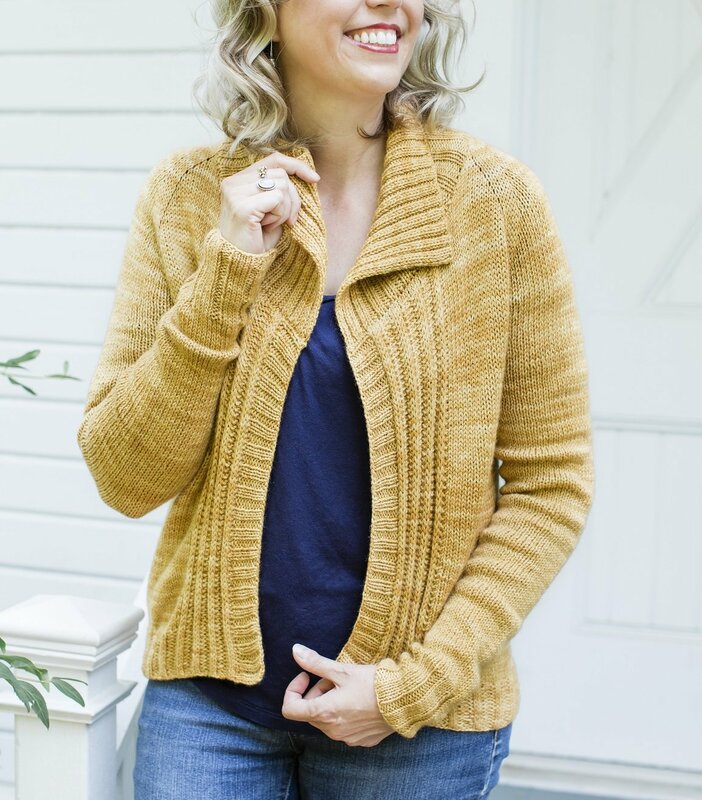 When working it on your actual sweater, you will want to use the same yarn you used in the project. The result will be quite subtle. I like to work right to left – you can start on either side (and if you are left handed and prefer to work left to right, please adjust accordingly). Read below the image for a description of each step. A) Choose your starting point. I generally start right at the beginning edge of the shoulder so I can work across the top of the shoulder all the way around the back of the neckline and end across the top of the shoulder on the other side. Insert your crochet hook down through the top to the bottom and draw up the working yarn from underneath. You should have a single loop on the right side/top of the sweater with the rest of the working yarn underneath. B) Keeping the first loop on your hook, insert the hook back down through the stitches to retrieve the working yarn again. In choosing where to place your hook, simply follow the natural “seam” of the neckline. 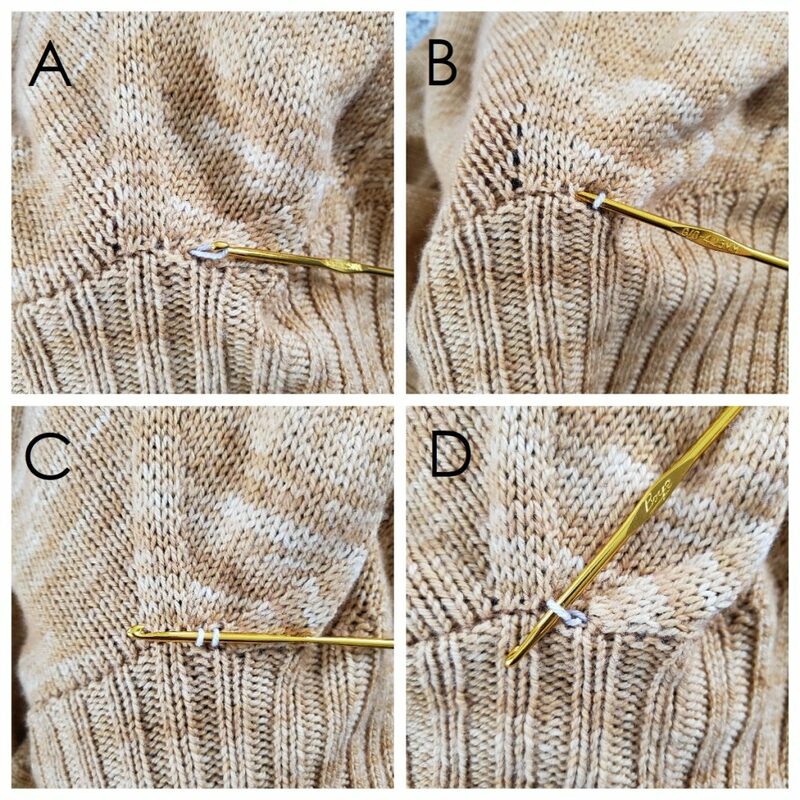 You will not go into each and every stitch – you are trying to reinforce this area, so you will generally be skipping over a stitch or two each time. DON’T panic about doing it right; it’s very very easy to start over and try again until it meets your needs. C and D) When you have two loops on your hook, draw the newest loop through the first loop on your hook. You will have created one visible stitch and will have one loop on your hook. Repeat this process by inserting the hook into the next reasonable stitch (right through the middle of the stitch) and drawing up the working yarn again, then drawing the new loop through the prior loop. E) Continue working across the neckline as shown. Remember, you can easily adjust your tension and can start again if you notice your stitch line is wobbly or seems too loose or too tight. 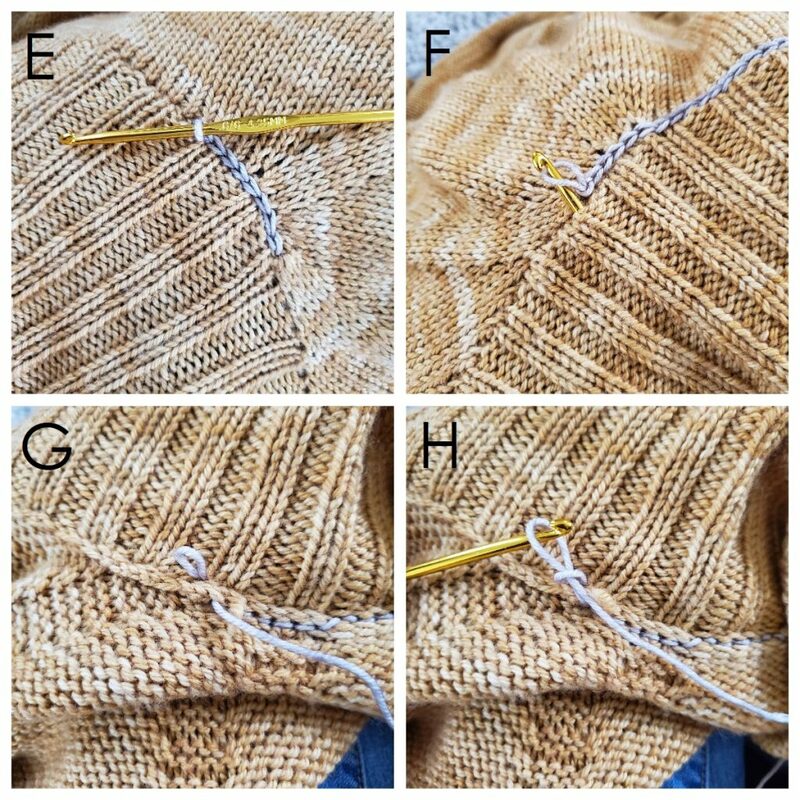 F) When you reach the end of the section you want to reinforce, bring your crochet hook underneath the sweater and reach up through from bottom to top to grab the remaining loop. G) The loop you’ve drawn through to the bottom (underneath) the garment should look similar to what is shown. H) Cut the working yarn and draw it through the loop and pull the stitch tight. This will neatly seal your work. If you are happy with the reinforced seam, weave-in the remaining thread. P.S. 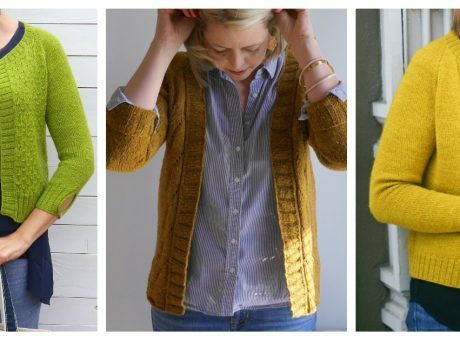 The featured sweater is my North Channel Collared Cardigan from my book Seamless Knit Sweaters in 2 Weeks. As you can see, the color of the yarn changes according to the light in which it’s photographed, but it is the same sweater throughout.